This January feeder.ro is celebrating 15 years of non-stop, relentless online activity. Acting as a cultural guide and developing as an open platform for emerging and alternative artists and makers, the project grows with new friends and connections. Huge thanks go to Cristian Vasile aka Igu, the founder of feeder.ro, who continues to be an inspiration through his personal projects, all the team involved over the years, the partners, supporters, friends, and most importantly, YOU, the reader! feeder.ro is „the alternative nation’s news agency”, a website which, for the past 15 years, has been publishing news and articles on the urban scene, alternative events, contemporary art, music, architecture, design, contemporary dance & more. Now we are broadening our scope in order to expand the conversation that feeder has been maintaining with its readers and partners. In its 15 years promoting quality events and news, feeder rounded up an online network of trendsetters and influencers, djs and promoters, along with visual artists and key figures in general who made their mark on and continue to advance Bucharest’s image, reaching more than 2 million visitors. More than 140 interviews explore the universe surrounding music and visual arts while connecting the local to the international creative scene. In order to expand the dialogue between the Romanian public and the artists we love, we’re sparking off inspiring conversations around today’s artistic landscape with newcomers and veterans alike. feeder sound is a showcase of local and international talent alike comprised of DJ sets and fresh tunes meticulously curated in a sound collection which promotes mutual recognition and cultural exchange between musicians worldwide. Almost 200 podcasts are online, introducing a total of 51 hours and 4 minutes of exciting, deep and immersive sounds. Been there liked that is the column for the perpetually in-the-know… and the FOMO-afflicted. Follow the feeder crew on weekends, weeknights & the odd lunchtime escape to sample local hotspots and review occasions for good old merriment. If you haven’t joined our bubbly newsletter yet, you can still check out who made the headlines in this regular update section. Organising or promoting an event? 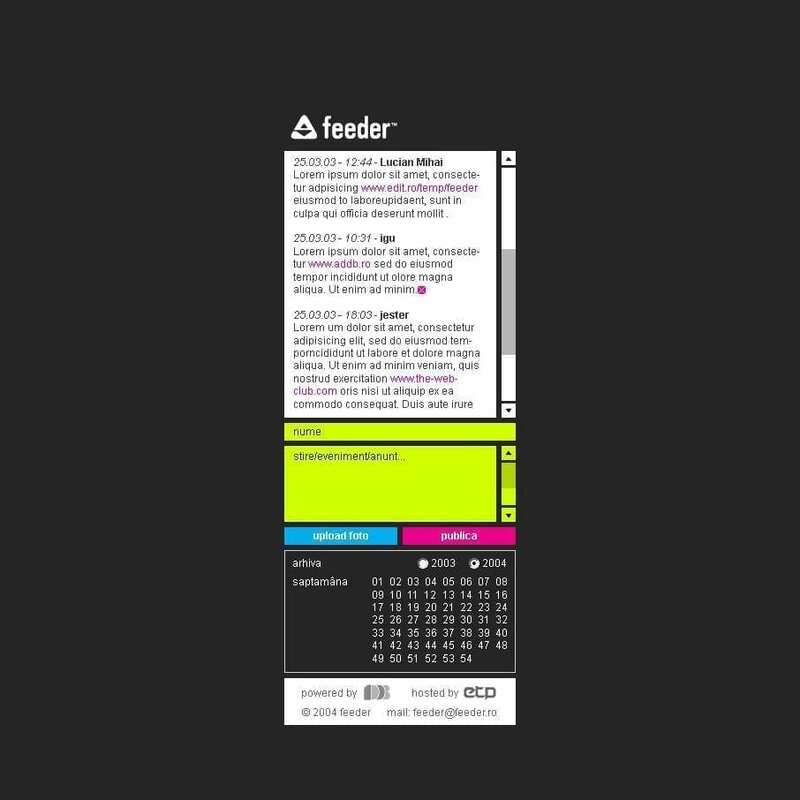 Submit it to feeder’s calendar – it’s both free and easy, conditioned by the editors’ approval. Mixing frolic with function, these are the lists you’ll be eager to start ticking off. Discover fresh selections of contemporary art galleries, coffee places, bistros, summer gardens or pools in Bucharest, and throughout Romania. Your clickable democracy. Make sentence! The biggest, the highest, the greatest, the longest, the nicest, the happiest, the most, the best – the ones you simply have to know about. Express your artistic side and join the OPEN CALLS produced by feeder.ro together with lovely partners and win cool prizes and excellent exposure. Contact us for personalized advertising options and check out the 14% discount. Ubic is one of the feeder’s veteran visitors and constant supporters. This fan-turned-contributor & our very own resident DJ gladly shares his latest mixes, charts, upcoming events and thought-provoking articles on electronic music, architecture and design. The fittingly irregular series by Cristina, the editor. Experiments included. Concerts, parties, festivals, movie screenings, art performances – Golden Ticket contest is a fun way to win a free pass for your next unforgettable weekend. May luck and random.org be with you! The long-awaited moment is finally here, feeder.ro launches the online shop! Starting this year in the feeder online shop you’ll find “all the bear necessities“: art toys, t-shirts, bags, stickers, magazines and the alternative tourist’s guide. The products are the result of current projects and campaigns: feeder.ro, Capitol / Cinema & Summer Theater and Un-hidden Bucharest, made in collaboration with some of the most remarkable contemporary artists. Un-hidden Bucharest I – 3 new art interventions and a guided art journey into public space. 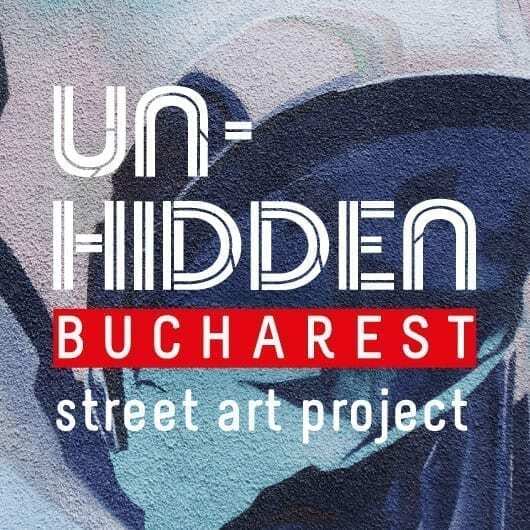 Un-hidden Bucharest is an urban regeneration project conceived as a series of 3 urban signals / artistic interventions in the public space, co-created with the community, aiming at humanizing Bucharest and promoting its understanding and exploration through art. Un-hidden Bucharest II is an urban regeneration project conceived as a series of 5 urban signals / artistic interventions in the public space, co-created with the community, aiming at humanizing Bucharest and promoting its understanding and exploration through art. It also produces a street art map of Bucharest, online & print and two street art workshops for children. 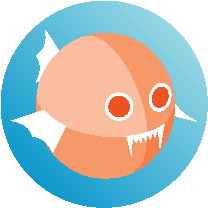 Scroll down to discover this edition’s activities and last year’s prolific amusements. 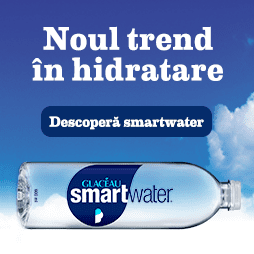 In 2017 – 2018, Save or Cancel proposes a cultural heritage awareness and sensitization campaign, with an application on Capitol Cinema / Theatre Summer, revealing the economic, social and educational potential of all abandoned cultural spaces in Romania, and the involvement of artists and the local community in trans-sectorial, multi-disciplinary, collaborative projects. 4 conferences, 3 art installations, 4 exhibitions and 3 open calls for ideas will reactivate the collective memory, reintegrate the monuments in the public circuit through democratic reinterpretations of the cultural space, explore the links between art, nature and the city. Find out how you can participate, here.